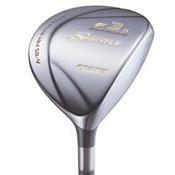 Good playability and distance stability and accuracy, classy looks, and high launch angle. I play off a 12-handicap, pretty strong with my woods and hitting average distances for my irons. My game fell apart a few months back when an old rugby injury came back after I sprained my left wrist hitting my ball out of some thick wiry rough. This injury had been nagging me so much that I just could not hit my irons at all. I have to resort to lofted woods which did improve somewhat but for distances below 7-iron I just cannot find an alternative. Not until I came across the Maruman Shuttle Wood-13 with a 30deg loft. Yes 30 deg. And this has been my answer ever since I added this magical piece in my bag. I'm back to my scoring the low 80s ever since. For those who are looking for such an alternative...go get yourself a Maruman Shuttle wood-13. I'm now contemplating its Wood-11 26 deg to replace my Makser Wood-9. I am not a good player and have always had trouble with the driver and my long irons. Imagine my pleasant surprise when I found this club that was able to drive as long as a driver off the tee and at the same time provide me the distance on the fairway! It also produces the most amazing sound when it is hit reasonably well (doesn't have ot be the perfect hit). I'm likely to go back for the 3 and 7 woods. These are the best Fairway Woods that I have used so far. Unlikely to change them for a long time. I bought a 5-Wood (18*) with SR Flex around a year back and immediately got hooked on. The sound is sweet and the club is so forgiving (even on mis-hit, your ball will still travel...). It has a very nice look and feel as well. 3-Wood (15*) & 9-Wood (24*) were bought this year to replace the driver and long irons respectively. Unfortunately, Maruman has replaced with a newer model (Shuttle) which I have yet to try out. Believe to be just as good. Adams ST Fairway, Adams Tight Lies, Adams Tight Lies 2, Sonartec SS-03, TM 200.